Lola Scarborough is a healer, a medicine woman and a visionary. She is a natural health and wellness consultant, a 500-hour certified yoga teacher, and a food wellness expert who has trained and cross-trained in multiple modalities, using food, herbs, supplements and lifestyle changes to effect positive physical, mental and emotional changes in people who are suffering in one way or another. She has certificates of training in Chinese Herbals and Qigong Food Healing as well as a degree in Ayurveda, the ancient health system of India. She is also a Life Coach. An energy body worker, at the age of 12 she was taught the art of energy healing by her grandmother, Lola Virginia, and has been doing it ever since, spanning the globe to learn about different styles. Lola is a world-traveler, having junketed to a number of international locations around the globe. Endlessly curious about other cultures and all kinds of people, plants, animals and landscapes, she is also a perpetual student of life. With a four-year degree in Political Science from the University of Houston, she worked in the business world for 25 years as a secretary, a technical writer and project manager. 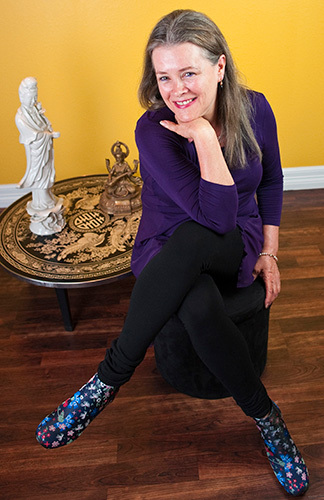 A mother, grandmother, wife, and avid animal rights supporter, Lola currently owns her own business, Yoga Lola Studios. She left the corporate world behind in 2007, purchased a commercial building along with her husband, and their wellness practice was born. She manages Yoga Lola Studios full time with husband Kevin by her side.